SIMON GENTRY A pril is packed. And I'm not. So much is going on in Houston this month that I doubt I'll have time for even the tiniest trip. I mean, after I return from New York. Saturday, April 6, is Stages Gala, manned by two of my favorites, Shannon Hall and Marcus Sloan of the brilliant Sloan/Hall design emporium. If no one else were even at the gala, these two guys would make it fun. I won't miss the RDA Home Tour Saturday and Sunday, April 6 and 7, as the gorgeous North Boulevard home of another of my favorite men, Mickey Rosmarin, is on the tour — as are nine other examples of Houston architecture at its best. Tuesday April 9, PaperCity's Kate Stukenberg heads up the PaperCity DesignLab at Houston Design Center, divulging all our digital secrets in a talk aimed at designers. Wednesday, April 10, designer Eric Cohler is at Decorative Center Houston in the Lee Jofa showroom at 11 am, penning bons mots in his new book, Eric Cohler, Cohler on Design. Thursday, April 11, is opening night of the wonderful Nantucket Showcase benefitting Legacy Community Health Services (open April 12 through 21 at various times). Friday, April 12, I sneak off to Dallas for Viktor & Rolf at Forty Five Ten and a look at the over-the-top Dallas Art Fair. Then it's back home to ready for the opening of the Jonathan Adler shop Thursday, April 18. Monday, April 15, opens Houston Modern Market (through Monday, April 22), with various design films shown throughout Houston and the Fair itself Friday – Sunday, April 19 – 21. Tuesday, April 23, PaperCity's Catherine D. Anspon presides at the PaperCity DesignLab art panel at the Nantucket Showcase. Wednesday, April 24, 1stdibs founder Michael Bruno kicks off the Lawndale Design Fair with a lecture at the MFAH's Brown Auditorium. The Fair runs Friday, April 26 (opening night preview party), through the weekend. Thursday, April 25, is architect Michael Imber signing his book Ranches, Villas & Houses at Greenwood King's The Lobby. While I have my design shoes on, don't forget to enter the PaperCity DesignAwards. Deadline for entries is April 19. See this page, below, for categories and more information. All the above wonderful events are detailed elsewhere in these pages. Holly Moore Editor in Chief holly@papercitymag.com MARCH 2013 | STYLE | FASHION | SOCIAL in 8 POP. ISSUEI P. this C ULTU R E . GOS S 4, 6, 10 O ver the years, I've had plenty of chuckles when I hear of others (read: competitors) describing PaperCity. The other day, I heard that an aspiring editor described us as "simply a social magazine." Hardly, señor. But I guess that's a good segue to reflect on what we are. Our executive fashion editor Kate Stukenburg travels back and forth to New York consistently, and has pulled off massive, complicated photo shoots for nearly a decade. Dallas editor Amy Adams was a creative director at Neiman Marcus for more than 10 years. I've found that both local and New York fashion retailers consider our fashion reach superior, thus we carry more luxury fashion ads than other local publications — even the ones with "Luxury" or "Fashion" in their titles. Though we don't call ourselves a home-design magazine, we could and probably should: Editor in chief Holly Moore edited Domestic Arts: Curated Interiors — one of the most successful interiors books from venerable art-house publisher Assouline — a visual collection of homes that have appeared in this magazine. Want art? Two years ago, our executive fine arts editor, Holly Moore Signing & Designing Parties: Museum of Fine Arts, Houston's One Great Night and Contemporary Arts Museum Houston's Another Great Night 12 Party: Party: Alley Gala kickoff at Louis Vuitton Party: The Menil Contemporaries' Blue Électrique Party: Miles Redd's Big Book of Chic Parties: Deborah Colton Gallery's "Plastic Fantastic" and Houston Young Professionals Society launch-party mixer. 17 26 28 22 Fashion: Chinoiserie chic Style: Inside the Head of Luvi Wheelock Pick of the New: Fresh spots to gaze and graze 30 33 38 Parties: Tootsies fêtes Danielle Rollins and raises funds for Dec My Room at Love's in Fashion. Parties: Elizabeth Anthony/Esther Wolf celebrates 50 years. Decoration: What's new in the design world 4044 Design: Artist Rusty Arena at 25 years Design: Inspirations from our favorite creatives Design: Nantucket Showcase opens. Design: Lawndale Art Center's Design Fair 2013 Style: Tweeting with the infamous Jenny Johnson 46 49 5254 Art: Five hot new art hives Parties: Galas galore — Orange Show Center for Visionary Art's "Rock 'n to our Roots," Fresh Arts' Ball 'n Chain, Houston Young People for the Arts Bootlegger's Ball Party: Arhaus Furniture's opening scene Michael Imber Catherine D. Anspon, authored the hugely successful coffee-table book Texas Artists Today, and she is a regular contributor to Artnews. Now, we do indeed publish our share of social coverage, and we have helped launch countless charities and elevated the profiles of countless others through our party photos and pre- and post-event coverage. So, in that sense of being social: Guilty as charged. In short, PaperCity does not address the hard-news social or political issues of the day, but we are true to the slogan that we have used over the years: We are "Deeply Shallow," for sure … Plug time: April 11 kicks off the Dallas Art Fair. The guys who run the Fair, John Sughrue and Chris Byrne, are true artists in their creativity and craft in producing this Fair, each year bringing you new and exciting elements. This year, their fifth, they weave a more intricate affair — with new layers and experiences. Visit and be inspired. Jim Kastleman, publisher jim@papercitymag.com Decorators are winging through Houston, signing books and talking design. 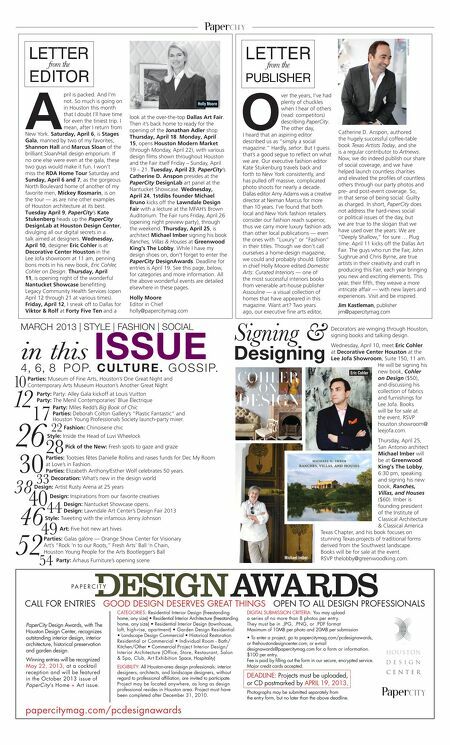 Wednesday, April 10, meet Eric Cohler at Decorative Center Houston at the Lee Jofa Showroom, Suite 150, 11 am. He will be signing his new book, Cohler Eric Cohler on Design ($50), and discussing his collection of fabrics and furnishings for Lee Jofa. Books will be for sale at the event. RSVP houston.showroom@ leejofa.com. Thursday, April 25, San Antonio architect Michael Imber will be at Greenwood King's The Lobby, 6:30 pm, speaking and signing his new book, Ranches, Villas, and Houses ($60). Imber is founding president of the Institute of Classical Architecture & Classical America Texas Chapter, and his book focuses on stunning Texas projects of traditional forms derived from the Southwest landscape. Books will be for sale at the event. RSVP thelobby@greenwoodking.com. CALL FOR ENTRIES GOOD DESIGN DESERVES GREAT THINGS OPEN TO ALL DESIGN PROFESSIONALS PaperCity Design Awards, with The Houston Design Center, recognizes outstanding interior design, interior architecture, historical preservation and garden design. Winning entries will be recognized May 22, 2013, at a cocktail reception and will be featured in the October 2013 issue of PaperCity's Home + Art issue. CATEGORIES: Residential Interior Design (freestanding home, any size) • Residential Interior Architecture (freestanding home, any size) • Residential Interior Design (townhouse, loft, high-rise, apartment) • Garden Design Residential • Landscape Design Commercial • Historical Restoration Residential or Commercial • Individual Room - Bath/ Kitchen/Other • Commercial Project Interior Design/ Interior Architecture (Office, Store, Restaurant, Salon & Spa, Club, Art Exhibition Space, Hospitality) ELIGIBILITY: All Houston-area design professionals: interior designers, architects, and landscape designers, without regard to professional affiliation, are invited to participate. Project may be located anywhere, as long as design professional resides in Houston area. Project must have been completed after December 31, 2010. papercitymag.com/pcdesignawards DIGITAL SUBMISSION CRITERIA: You may upload a series of no more than 8 photos per entry. They must be in .JPG, .PNG, or .PDF format Maximum of 10MB per photo and 20MB per submission • To enter a project, go to papercitymag.com/pcdesignawards, or thehoustondesigncenter.com; or e-mail designawards@papercitymag.com for a form or information. $100 per entry. Fee is paid by filling out the form in our secure, encrypted service. Major credit cards accepted. DEADLINE: Projects must be uploaded, or CD postmarked by APRIL 19, 2013. Photographs may be submitted separately from the entry form, but no later than the above deadline.